PKI is a set of physical devices used to create certificates which bind a user public key to its real identity. The concept of the PKI (also known as asymmetric cryptography) is based on the fact that each peer has its own set of private and public key. SSL will use the PKI to authenticate the OpenVPN peers before transmitting ciphered data. The private key of a peer is kept secret and its public key publicly diffused via Certificates. The goal of a certificate is to certify that a public key belongs to the person who claims to be its owner (ie: the people owning the mathing private key). Without certificates, you couldn't be sure that a public key really matches the people who owns the matching private key. To certify its identity, a certificate is signed by an authority that can be trusted by everyone: the Certification Autority (CA). Some companies like VeriSign (No1) and Comodo (No2) have made their business selling certificates. It is also possible to create a private CA in an internal network for testing purposes. As a matter of fact, this is what will be done in our tutorials. The CA signs certificates with its private key and publishes its public key under the shape of a certificate to everyone. (The CA certificate is signed by its own private). The client first creates a private key and a certificate request file using the RSA algorithm. This file is sent to the CA which will build the client certificate and send it back to the client. In our scenario, we will use a simpler process as we are in a laboratory. The client private key is created on the CA machine together with the certificate. The client no longer needs to send a certificate request to the CA. The client private key and certificate are transferred from the CA to the client. Of course this way of creating certificates must only be used in test environements for obvious security reasons. Indeed, the private key could be captured during its transfer. In the first process described above, the private key never leaves the client machine. Two peers called Alice and Bob are used to illustrate the asymmetric keys usages. Alice signs a file with her private key. The signature will have the forms of a series of unreadable characters that can only be decrypted with Alice's public key. So Bob will need Alice's public key to read in clear text the signature file. Alice uses her private key with Bob's public key to generate a shared key which will be the same one generated by Bob using his private key and Alice's public key. This shared secret is then used by a symmetric algorithms such as DES or AES. It has the advantage of being much quicker than asymmetric encryption. When Alice wants to send encrypted data to Bob, Alice uses Bob's certificate to cipher the data. Thank to his private, Bob will be the only people able to decipher that data. OpenVPN provides a set of scripts based on OpenSSL in order to make the certificates and keys generation process easier. We will study the PKI building under Linux and Windows platforms. To get full details about OpenSSL use, see the OpenSSL website. Clean the keys folder and remove any old key. Create the CA private key and certificate. 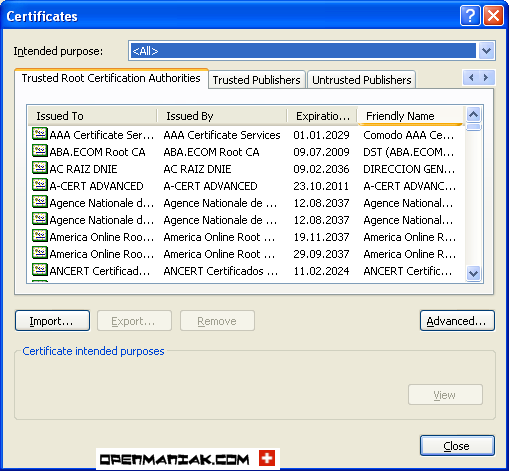 The certificate includes the public key. The CA certificate which includes the CA public key, is signed by its own private key. Create the OpenVPN server private key and certificate. This script has two openssl commands, the first will create a private key and a request certificate file and the second will create the certificate with the CA private key. Create the OpenVPN client private key and certificate. We now have the OpenVPN client and server certificates and private keys. You need to copy the private keys and certificates on the appropriate Open devices, i.e. the client private key and certificate must be copied onto the OpenVPN client and same thing for the server. As already explained earlier, we used the Certificat Autority (CA) to generate the private keys and certificates. This process should be only used in a laboratory environment due to the fact that the CA must transfer the client's private key. The Diffie-Hellman key exchange is a cryptography process used by two peers to establish a shared secret known to them only. Let's create the Diffie-Hellman (DH) settings. Only the OpenVPN server needs the DH settings, not the OpenVPN client.